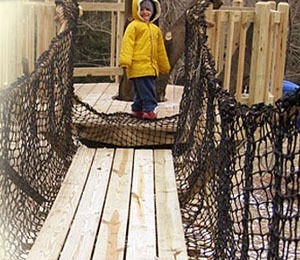 Bridges of all types add a lot of quality and adventure to a tree house project. Walking through the trees looking down at the forest floor makes us feel more like part of the tree canopy rather than earth dwellers. Bridges are the best way to connect two tree house platforms to each other. We also build bridges from the ground up to a tree house or from a back deck out to a tree house. Construction of a short rope bridge is a reasonably simple task. However, some suspension bridges span great distances and require more serious design & construction practices. If you would like to build your own cable bridge like the ones we build, then check out the treehouse bridge kits at Treehouse Supplies. They do require assembly, but instructions and support are included. The costs for small bridges in between tree house platforms normally range from $3000 to $20,000. The costs for large cable bridges can be between $60,000 and $500,000. The big price ranges are because the length and site specific factors can make the cost vary greatly. Remember that large bridges such as canyon crossings will require site visits, careful measurements, engineering, and large towers and/or footings to ensure safety. Bridges can be made from different combinations of materials such as rope, cable, chain, steel, and wood. The choice is made based on the required strength, the intended use of the bridge, and the aesthetic preference of the owner or designer. Our preferred method is to use cable for the main suspension, and then netting on the sides to prevent little bridge visitors from falling off as they traverse. On shorter bridges, we can consider alternate methods such as a rope only bridge. Larger, more serious cable suspension bridges may require concrete footings, towers, and stiffer walking surfaces than wood planks. Trees are very strong, but they are not accustomed to resisting large lateral forces. They can support a great deal of weight, especially near to the ground. The trouble is, with larger suspension bridges, the long upper cables are attached high in the tree and pull not straight down but inward to the center of the bridge. This is quite unnatural and with medium to large bridges, the limits of the trees can be exceeded even when guy wires are attached appropriately. In such cases, towers are erected to support each side of the bridge. These towers must be designed by qualified engineers in order to make sure that appropriate materials are custom fabricated for each bridge project. To get started, we normally need to see the site, take measurements, and tell you what we can and can’t do for you, and what it will cost. We do charge for such site feasibility studies, and the fees are based on our travel costs and time spent on the visit. If you would like to get a free estimate before paying for the feasibility study, then please get us some preliminary information such as the rough topography, pictures, the length, and any other site specific factors that will help us give you an estimate in the form of an expected price range. Our estimates for rope, cable, or suspension bridges that are of reasonable length between two appropriate sized trees are generally pretty accurate, but for larger bridges, we normally can’t commit to the final price until we see it. We’ll be happy to discuss your project with you, so please contact us and we’ll do our best to answer your questions and/or set up a feasibility study.